Forsythia bushes are a fairly common bush to have in your yard here in Southern Tennessee and Northern Alabama simply because they are so easy to grow. But, if you are a florist or if you just like making your own flower arrangements, you will certainly want to have several of these beautiful bushes growing in your yard. I love them because they have so many uses throughout most of the year. In the late winter you can use just the branches to create some cool looking “Winter Ice” arrangements. Then, as it gets close to Spring, you can cut some of the branches and bring them into your home and fool them into thinking that it’s Spring. Yep, that’s what I said….you can fool them and they will bloom. When they feel the warmth in your home, they think it’s Spring and they will start blooming: this is called Forcing. Then, of course they will start to bloom these beautiful yellow blooms right around the first week of Spring. The blooms will last for about 2-3 weeks on the bush and then the foliage will start to grow on the branches. Soon, by summer, you will have beautiful branches covered in lush green foliage. I use this foliage literally throughout the entire Summer season. One of the reasons I love these bushes so much is the mere fact that they are so easy to plant. You can root them very easily in a bucket of water or you can just stick one of the branches into the dirt and they will eventually root. You must keep these branches very wet in order for them to root. That’s why they do so well here in the South because we have very wet winters. My yard is literally like a marsh land in the Winter months…so it’s very easy to root these little beauties. And, within about 3 years you will have a shrub big enough that you can begin to harvest the branches for your flower arrangements. They make such striking statements in your arrangements when they are full of their yellow bell blooms. And, you can’t beat them for their foliage in the Summer months. Foliage can be just as expensive to purchase from florists as flowers are. So, anytime that you can plant shrubs in your yard that you can cut from, you will be saving a ton of money as you design your beautiful flower arrangements. 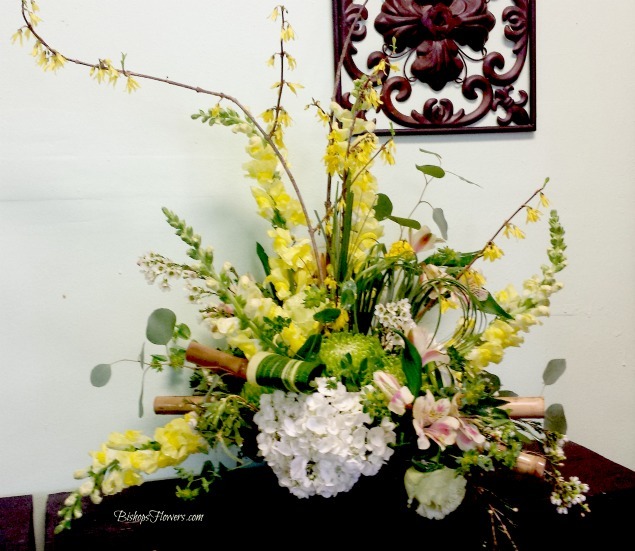 Click Here to see my other blog post about how I plant my Forsythia Bushes for my flower arrangements.